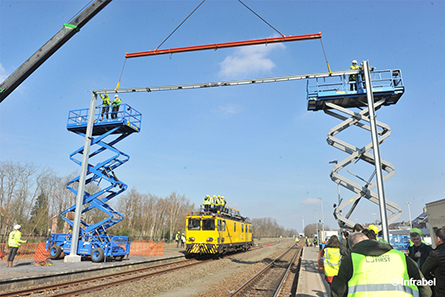 Electrification work between Mol and Hasselt has started! 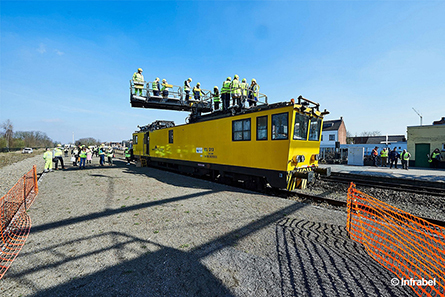 Thursday 21 March 2019 saw the kick-off of electrification work on line 15 between Mol and Hasselt. The press conference took place in the presence of François BELLOT (Federal Minister of Mobility), Ben WEYTS (Flemish Minister of Mobility), Luc LALLEMAND (CEO Infrabel), Herman REYNDERS (Governor of Limburg Province) and Wouter BEKE and Johan LEYSEN (Mayors). TUC RAIL was represented by CEO Jochen BULTINCK and a large number of members of the team that will monitor the work for TUC RAIL. From the end of 2022, all trains from Antwerp to Hasselt will be able to run on electricity. A total of 1.250 new catenary supports were installed and 1.400 tons of steel will be used for the catenary constructions. 58 km of catenary will be installed on Line 15: 38 km of track between Mol and the Zonhoven branch line, of which 10 km of double track between Beverlo and Zolder, a side track in Leopoldsburg and various sidings in Mol. This requires the unwinding of more than 300 km of new catenary cables and wires. In addition, electrification requires other infrastructure work such as the raising of 4 bridges (the bridges Stationsstraat, Zandstraat en Koerselsesteenweg in Beringen and the “recreative bicycle path” bridge in Zolder) and modifications to the railings of 5 other bridges. TUC RAIL will also thoroughly renovate the bridge over the Dessel-Kwaadmechelen canal and upgrade various switches in Mol station. Track work will also be carried out as part of the raising of the bridge over the Albert Canal in Kuringen. This project will not only increase capacity and passenger comfort but will also benefit punctuality and environment.